We dance for evolution. For upliftment. For progress. For Transformation. Personal and global. for Peace and for Love. burn away barriers and reconnect to the Great Mystery. We dance for communion with the Infinite. to our Source and our Light. We dance to listen, to pray, and receive. and get back up when things get rough. We dance to build resilience and courage in community, for community. We dance to bond together in ways that feel real. across age, gender, status, colors and religion. We dance to be welcomed home within, again and again. We dance to be witnessed where it’s safe and sacred. We dance to join forces and honor our ancestors that makes us who we are. for whom we will leave this world a legacy to. We dance, because we love to dance, and that makes us feel fully Alive! The universe is calling us to a new consciousness, bringing us back in touch with our authentic nature in harmony with the earth and one another. Through conscious dance and intentional flash mobs, Dancing without Borders is reclaiming the healing and unifying power of dance and music as a ritual, community building and empowerment vehicle. By dancing together with intention on high vibrational music, we ignite our light within, unite, inspire and empower each other and renew our spirit as a collective. 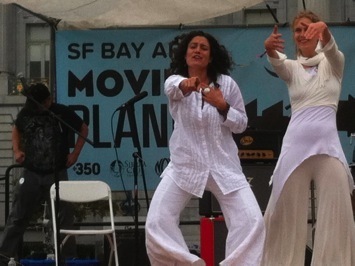 Dancing without Borders facilitates awakening and enlivening experiences with people across generations, colors and views during mass activist gatherings and festivals. I hope you join us in this MOVEment and dance the revolution! If I can’t sing and dance, I don’t want to take part of your revolution.